It's not how long it takes you to make them. It's when you wear them. And that's why we call them weekend socks. As my first loom-knitting class discovered, it's gonna take a few lessons for that first pair of chunky socks. 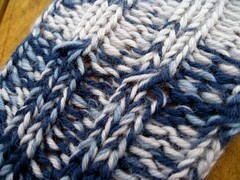 But as soon as you find your rhythm between the knits and purls, it becomes "surprisingly fun" as one student put it. I have my fingers crossed that they will feel the same way once we reach the heel. I wrote a pattern for a yarn shop class that is a simple rib knit with a bonus cable row. 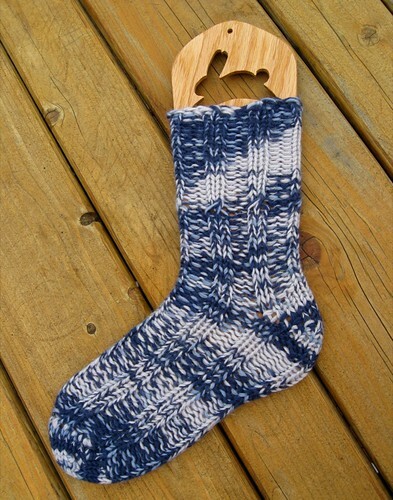 If you'd like an easy sock pattern to get your feet wet, grab your blue Knifty Knitter round loom and click the button below. You can check out more free and for-sale patterns in the right column now, too! They are available through Ravelry's shopping cart. You don't need a Ravelry account though — just a Paypal one. And now that I think about it, maybe I could knit a pair of these socks in a weekend.